In April 2017, Davidoff announced a series of limited production 6 x 60 line extensions to its “Discovery Pillar” (i.e. Black Label) cigars. 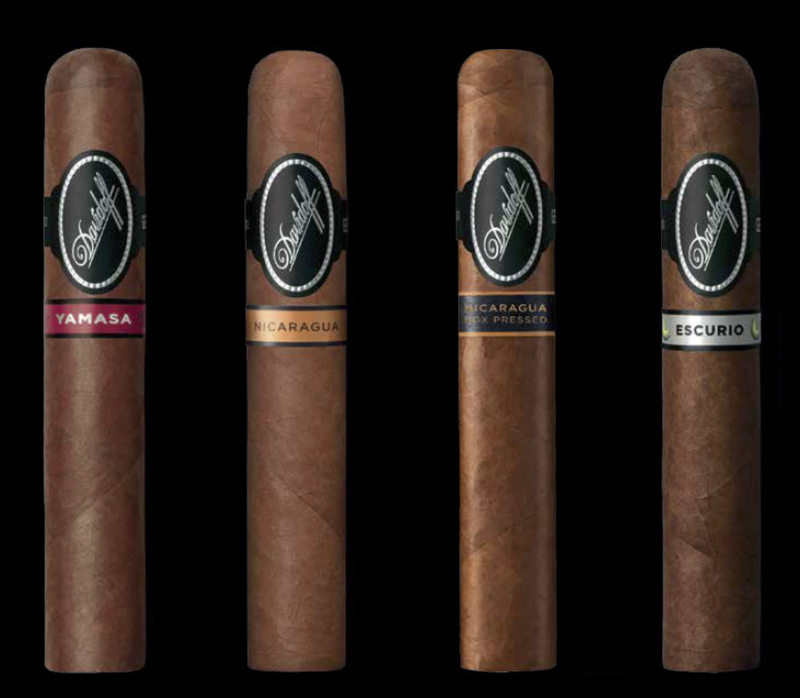 This set of new line extensions would encompass the Davidoff Escurio, Davidoff Yamasá, Davidoff Nicaragua, and Davidoff Nicaragua Box Pressed lines. 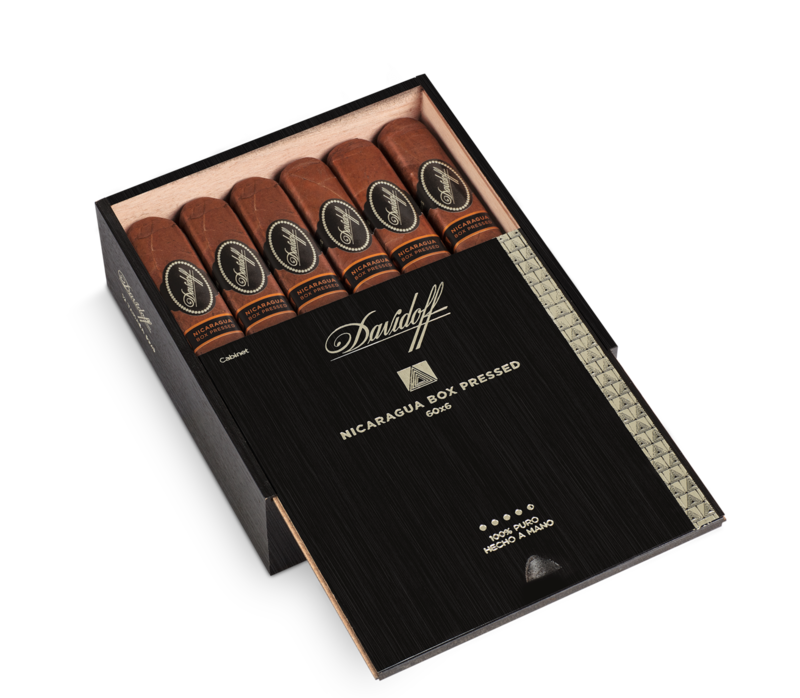 These cigars marked the first 6 x 60 Davidoff branded cigars since the Davidoff Year of the Horse was released late in 2013. For Davidoff Nicaragua Box Pressed, this would be the first new vitola since that line was launched in 2016. The Davidoff Nicaragua Box Pressed 6 x 60 was also significant as it was the first box pressed 6 x 60 vitola under the Davidoff name. Recently I’ve had an opportunity to smoke the Davidoff Nicaragua Box Pressed 6 x 60. Overall I found the 6 x 60 to be an excellent representation of the Davidoff Nicaragua Box Pressed line. Since Davidoff CEO Hans-Kristian Hoejsgaard came on board in 2011, he has implemented product innovation as a part of its corporate strategy. Up until a few years ago, box pressed cigars were something that were not found in the Davidoff portfolio. In 2013, the Avo brand saw the release of the Avo Movement TAA release. This was followed up in 2015 by a full box-pressed line with the Avo Syncro Nicaragua. 2017 has been a big year for Davidoff box press releases including the new Camacho BXP line, the Avo Syncro South America Ritmo, and he new Davidoff Nicaragua Box Pressed 6 x 60. Without further ado, let’s break down the Davidoff Nicaragua Box Pressed 6 x 60 and see what this cigar brings to the table. The original Davidoff Nicaragua was a landmark release that was also a result of the company’s innovation strategy as it was the first Davidoff branded Nicaraguan puro. While the Davidoff Box Pressed is based somewhat on the original Davidoff Nicaragua line, it differs in two ways. First up, the Davidoff Nicaragua Box Pressed uses a Nicaraguan Habana Oscura wrapper as opposed to the Nicaragua Habana Rosado wrapper on the base line. Secondly, the Esteli Visus priming found in the original Davidoff Nicaragua was upgraded to ligero priming. Davidoff says these changes were intended to deliver a bolder, more intense smoking experience. The Davidoff Nicaragua Box Pressed is available in three sizes. The 6 x 60 comes packaged in 12 count boxes. The Habana Oscuro wrapper of the Davidoff Nicaragua Box Pressed 6 x 60 has a medium brown color to it. Depending on how the light shines on it, the wrapper will give off different degrees of a dark cinnamon color tint. On the surface of the wrapper there is some darker mottling present. The surface is smooth with a light coating of oil on it. Most of the visible wrapper seams and veins were on the thin side. The box press itself was firm. There also was a slight curve to the box press. The Davidoff Nicaragua Box Pressed has two bands. The primary band uses the same design as the rest of the Davidoff Nicaragua line. This is a black and silver colored version of the Davidoff White Label design. The background is black with the font text and surrounding trim in silver. The Davidoff scripted logo is on the front. To the left of the logo is the text “6 x 60”. To the right is the text “GENEVE” (on all of the vitolas). Prior to lighting up the Davidoff Nicaragua Box Pressed 6 x 60, I opted to use my usual choice of a straight cut. Once the cap was clipped, I proceeded with the pre-light draw ritual. The dry draw delivered a mix of chocolate, cedar, and earth. Overall I found the pre-light draw of this cigar to be excellent. At this point I was ready to light up the Davidoff Nicaragua Box Pressed 6 x 60 and see what the smoking phase would have in store. The Davidoff Nicaragua Box Pressed 6 x 60 started out with notes of earth, cedar, chocolate, and hay. Early on, the earth and chocolate notes moved to the forefront while the cedar and hay settled in the background. There was a creamy texture to the flavors and as a result the profile of the Davidoff Nicaragua Box Pressed 6 x 60 had some smoothness. Meanwhile the retro-hale delivered a mix of herbal spice and red pepper. The chocolate and earth notes alternated in intensity throughout the first third. This continued into the second third. The cedar and hay notes remained in the background. During the second third, some red pepper surfaced on the tongue in the background. The red pepper did take over the retro-hale and at times had a sharper spice. During this phase, the creaminess and smoothness diminished. By the last third of the Davidoff Nicaragua Box Pressed 6 x 60, the main flavors were the earth, cedar, and red pepper. By this point, the chocolate and hay were not much of a factor and the creaminess now was completely dissipated. This is the way the smoking experience of the Davidoff Nicaragua Box Pressed 6 x 60 came to a close. The resulting nub was cool in temperature and near firm to the touch. The burn to the Davidoff Nicaragua Box Pressed 6 x 60 performed quite well in the early stages. The cigar maintained a straight burn line and straight burn path. A little further into the cigar experience, the burn line did get a little more irregular. This was remedied with some touch-ups. While at times there was a slight jaggedness on the burn line, I didn’t find the cigar was in danger of meandering off track. The resulting ash was gray in color. This was not the firmest ash, but it was not a loose flaky ash either. As for the burn rate and burn temperature, both were ideal. Sometimes a large ring box press can have a more open draw than I prefer. This was not the case with the Davidoff Nicaragua Box Pressed 6 x 60. I found this cigar delivered the right amount of resistance from start to finish. This was a low maintenance cigar to derive flavor from. When comparing the original Davidoff Nicaragua to the Davidoff Nicaragua Box Pressed, the Box Pressed line lives up to being a bolder smoke. Within the Davidoff Nicaragua Box Pressed line, I did find the 6 x 60 to be slightly dialed back when compared to the Toro size. The Davidoff Nicaragua Box Pressed 6 x 60 started out with medium strength. By the second half, the strength moved into medium to full territory. As the cigar moved through the second half, I did find the increase in strength leveled off. 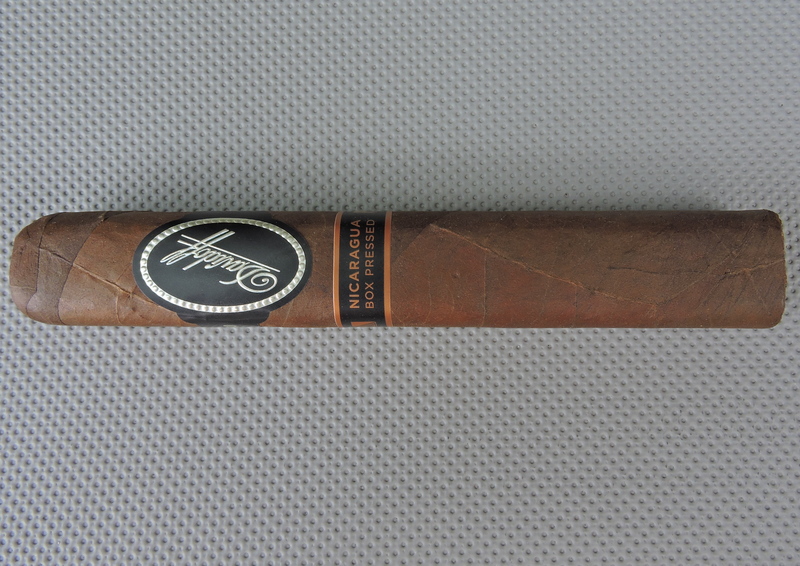 Meanwhile the Davidoff Nicaragua Box Pressed 6 x 60 also started out medium-bodied. There was a gradual increase in body as the smoking experience progressed. By the final third, the 6 x 60 moved into medium to full-bodied territory. In terms of strength versus body on the Davidoff Nicaragua Box Pressed 6 x 60, I found both attributes balanced each other nicely early on, however by the second half, I found the strength had a slight edge. The strength having the edge was something I also assessed on the Toro size. I think 6 x 60 cigars are often misunderstood. I think they have been a very good thing for the cigar industry as it has brought in a lot of new cigar enthusiasts. At the same time, like any vitola – sometimes a blend works and sometimes it doesn’t. With the Davidoff Nicaragua Box Pressed, I found the flavors delivered really worked really nicely with the larger format. While I did find the 6 x 60 to be slightly dialed back from the Toro in terms of strength and body, this the 6 x 60 will still deliver on the Nicaragua Box Pressed’s mantra of delivering a bolder, spicier Davidoff. This is a cigar I’d probably steer to someone more experienced as it does kick up in boldness in the second half. At the same time, I would encourage those who do not smoke 6 x 60s to give this cigar a try. As for myself, this is a cigar I’d easily smoke again – and it’s worthy of a box purchase.